When I first moved to Chicago, I lived in Andersonville, and I joined a little storefront gym called Know No Limits. It was friendly, welcoming, laid back and non-judgmental, and I loved it. This is not that gym. What I *thought* we had made an appointment for (and Randi was with me the whole time, but I was too lazy to draw her tonight, sorry Randi!) was a quick tour of the weight machines, so I can use them without hurting myself. Our appointment ended up being a “free personal training session” which quickly turned into a Very Pushy Hard Sell for expensive personal training. No weight machines though. To be fair, the personal training was good, and hard, and fun. I’m achy all over. And to be fair, they were only doing their jobs. But DUDE. I didn’t say I wanted to lose weight, so to suggest that as my goal is pretty rude. To suggest that I lose twenty pounds in a MONTH is just effing UNHEALTHY, and you have no business advising anyone on nutrition. Also, it’s a fair point that I should probably be having something to eat midmorning and midafternoon, especially considering my long bike commute, but surely there’s some ACTUAL food that I could be eating then, instead of the weird chemical formulas that OH, BY THE WAY, are coincidentally for sale in the gym’s lobby. And she seriously didn’t believe me when I told her I didn’t snack on chips all night. I don’t think she heard me when I told her I’d been keeping a very public comic food diary for a year and a half. I had a hard time convincing her I haven’t had fast food in years, too. None of the staff listened to a word I said, they just looked at my size and shape and made up their minds about me. Also, it should be horrifying that anyone would cry just from stepping on a scale. It shouldn’t be matter-of-fact, and it shouldn’t be normal. Ladies – no, EVERYONE : YOU ARE SO MUCH MORE THAN THAT STUPID NUMBER, and you shouldn’t let some sports bra let you think it’s NORMAL for that number to make you cry. I know I’m ranting. I’m sorry. The whole thing has just made me angrier and angrier. I would honestly quit this gym out of principle, or spite even – except that it’s three blocks from my house and it’s $20 a month. Randi and I decided we’re going to keep our memberships, but make every effort to avoid ever talking to the staff there again. I can figure out the weight machines on my own, buttholes. I’m told this is how gyms usually are, so now I feel like Know No Limits spoiled me with their awesomeness. I think we baffled the staff with our lack of pointless-goal-in-a-meaningless-time-frame. They must get 90% people who are desperate to lose X pounds before a wedding or something. There were several questions on the enrollment forms about what our goals were, and what timeframe we wanted to accomplish them. I couldn’t think of anything else to say, so I kept writing “soon” and “eventually”. One last thing, even though I know I’ve written a Russian novel already. Usually, when I spend any time working out, it leaves me feeling lots more charitable about myself. I will pass my reflection in the mirror on my way to go running and think “if only I could lose that belly”. 25 minutes of jogging later, I’ll pass my same reflection and think “why was I so harsh on myself? Not bad, lady.” Obviously I haven’t lost any weight or inches in 25 minutes of running, but the act of working out makes me think kinder thoughts about my body. Leaving this particular workout – and the personal training session was a crazy heavy workout – I felt worse about myself. Walking home, I felt fat and dissatisfied with my body. Was it having my weight and BMI recorded by these people? Was it the “20 pounds in a month” comment? The assumptions about my eating habits? Was it just the general culture there? I have no idea. But I know myself, and I know that shame doesn’t motivate me. I doubt shame really motivates anyone. In HAES they say if guilt and shame were effective motivators for weight loss, there wouldn’t be any fat people. Because all fat people GET from the world is shame. Basically I think a lot more people would be members of gyms if so many gyms weren’t staffed with so many shallow, judgmental people. I’m going to really enjoy having access to their machines in the dead of winter, but I think the secret will be to never interact with any of the staff there, ever again. My week from hell *appears* to be over. I got up early on Saturday to tear through coloring my piece for Womanthology, and finished a CD jacket commission on Sunday, and I think by Sunday night it all caught up to me. I drew this last night, and managed to scan it, but I completely passed out before finishing it. We had a fun weekend though. Ate some delicious mussels at Revolution Brewing, made myself some slow cooker hoisin lamb chops, attended a mud wrestling event (it’s true! Niles won a raffle prize and now we have a giant metal PBR sign, I have no idea where we’re going to put it), and enjoyed the perfect, perfect weather. Also, I engaged in a little retail therapy and treated myself to a set of watercolor paints. They are lovely to work with! 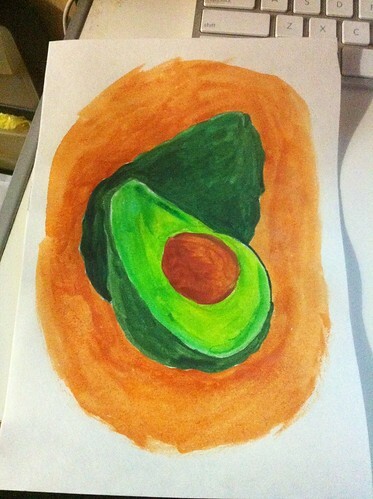 Here’s an avocado. Guys, I am having a bad freaking week. The things I am being asked to “design” in Microsoft Word this week go against everything that is good and right in God’s universe. Okay. I *might* have a little bit of a tendency towards the dramatic and fatalistic. And (I do this when I’m sick too) I have a hard time remembering sometimes that everything is finite, there is a light at the end of the tunnel, and my life won’t always be like this. But this week has been pretty horrible. I’m going into work early and leaving late and wrestling with the brutal horribleness that is Microsoft Word the whole time. I’m short on sleep and patience and I really, really, really miss my free time. Fortunately it should all be over soon, but in the meantime, here’s a pretty accurate self-portrait. HA! Just kidding; my desk has NEVER been that clean. But I did wear very cute shoes today. Now: some precious hours of sleep before it’s time to do it all over again tomorrow. So I haven’t satisfied my current bibimbap craving, and I apparently still have it on the mind. But I realized, it’s kind of an unusual dish for most westerners, and maybe I should explain why it’s so great. The strength of it is that it’s a ton of wonderfully distinct and interesting flavors, which blend together in such a way that it’s very much greater than the sum of its parts. Bibimbap can vary, but it’s pretty much rice, assorted cooked vegetables, and some meat. Dolsot bibimbap is cooked in a super-hot stone bowl that sizzles and turns the rice at the bottom all crunchy and crispy and delicious. The best is when you drizzle the whole bowl with sweet red pepper paste and stir it all together, then it’s just perfect. If you live in Chicago, I can personally vouch for the bibimbap at Woo Chon at Lincoln and California, and Gosu in Logan Square. I really should have just gone to Gosu this weekend – I’ve learned by now that once I get a bibimbap craving, it doesn’t go away until I get some. Oh man, you guys, I want a dolsot bibimbap SO BAD right now. Have I mentioned this before? I was an insanely picky eater as a child. My family made fun of me because we’d go to dinner and I’d only want to eat a roll. I would go for months wanting to eat nothing but plain yogurt, or cinnamon and brown sugar oatmeal. It’s been so gradual it’s hard to see the thread connecting tiny me, who just wanted white bread (“cotton bread”, as my dad calls it) and current me, who has seriously been craving dolsot bibimbap for a few weeks now. Oh God, with tons of hot sauce, and everything all mixed together, and the rice getting all crispy on the bottom of the stone bowl and oh god why am I not eating it right now? Is it odd though, that when I think about the culinary equivalent of a warm snuggly hug these days, all of my current comfort food dishes are east and southeast Asian? I seriously tried to think of a more diverse selection, but these are all my best and favoritest food-hugs. It seems so stupid now, to think that I ever thought these things. Comicon is done now! My feet are tired. So is my brain. So this will be brief. Wizard World Chicago is out in Rosemont, so there’s nowhere to walk to for decent food, and all they sell at the concession stands are greasy breadtangles of pizza and overpriced heat lamp hot dogs. The first time I did Comicon, the combination of the recycled air, artificial lights, constant ambient noise, and crappy, crappy, crappy food – I had the most skull-splitting migraine I had ever experienced. It was the first time that I fully realized the direct connection between what you eat and how you feel. So these days when I do conventions, I try to eat as healthfully as I can, since everything else about the convention can be a strain on the body and mind. The first day we had tasty brown rice maki; the second day I had a big spinach salad. The last day we polished off leftover pizza, which wasn’t incredibly healthy, but it was covered in lots of spinach and mushrooms, and it was at least decent pizza. Now I’m exhausted, of course, but my head isn’t splitting open, so I think I came out ahead. I want to thank everyone who stopped by my booth SO MUCH, you guys are so awesome!! I had a great show, and a great time watching all of the great costumes and talking to everyone. I’m very much looking forward to getting a good night’s sleep tonight and getting back to my normal routine. Also! Eliza Frye (her site might be a wee bit NSFW, depending on how fascist your employer is) was also exhibiting there, and she stayed with us for the weekend. We have had an awesome time, and are kind of discussing tabling together at San Diego next year, if we can make it work. But you guys should definitely check out her art (especially The Lady’s Murder), and her Kickstarter. It’s already fully funded but you can still contribute and get some really kickass rewards. Ok! I’m going to get some well-earned sleep now. Guys it’s Wizard World, I just got home, I’m tired already from preview night, and I have three more days of this. So it’s a short update tonight. Come out to Rosemont and see me! Mutton Chops! Not the facial hair ones. I feel like it’s a cop out when I use my Sauceome page to draw what I’m eating, because it’s so fun for me. Niles put some mutton chops in the slow cooker this afternoon so they’d be ready for dinner tonight, and they were delicious, but mostly it was just really nice to not have to think about making dinner tonight. I’ve managed to cross a number of things off my giant list of deadlines, but there’s still plenty. Speaking of! * I’m going to be at Wizard World Chicago this weekend!! Booth 3254 in Artists’ Alley, with artist Allie Bustion. The bad news is we are waaaaaaay in the back. The good news is we are right by the bathrooms! Convenient! I promise to stop taking cell phone pictures of cosplayers long enough to sell you things. I’ll have books, Sauceome prints, probably some old serigraphs and linoblock prints, and some League of Courteous Cyclists shirts and stickers! Come out and see me! * Speaking of those, ALL PREORDERS (and some post-orders) for League of Courteous Cyclists shirts have been shipped!! If you’re in the US you should see them in a week or so. International orders will take longer, of course.